Timing and pacing is very important to me when it comes to me watching shoujo anime, especially within that 12 episode time crunch. With shoujo romances I like to see a nice a steady progression between the two soon to be flowering pairings. 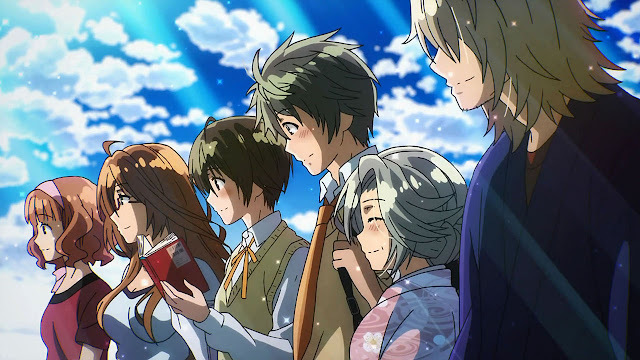 Watching Bokura wa Minna Kawaisou gave me exactly that - it's a shoujo that's not pushed to it's wit's end . The conclusion of Bokura wa Minna Kawaisou it ends at the climax - and without a second season to wrap everything up, the first season is quite pointless but still worth a watch. The story follows a high-schooler named Kazunari Usa as he moves into a boarding house complex, the anime illustrates the unique blossoming relationship he has with fellow roommate, Ritsu Kawai. On top of that we see the connections Kazunari develops as a result from living under the Kawai complex. The art and sound is an area where I find this anime does an interesting job in in. The sound is perfect; everything from the pedalling of the bikes to the rustling of the bed sheets when someone wakes up is heard, it’s all there. The art is quite special as well, the colours are vibrant and pleasing to the eyes and it's evident that throughout the anime purple and blue tones were used as a forefront colour scheme. Charm and loveable characters are very difficult to radiate in an anime, specifically when there's a board spectrum of personalities from shy-introvert Ritsu to unusual/creepy Shirosaki to dysfunctional Mayumi. Even with that said everyone in this anime unusually interacts in harmony with each other, some people whom have opposite personalities from each other work hand in hand to create interesting chemistry to watch. And I'm sure you will find someone from this anime that will gravitate towards you. In terms of character development, we have Ritsu as the frontrunner for this aspect. Her development is stemmed from the main plot of this anime, which is flowering relationship between herself and Kazunari. If I were to use the caterpillar, cocoon, butterfly analogy; I would say that Ritsu evolved from a caterpillar to a cocoon by the end of the series (watch the anime and you'll understand what I mean). Which I find perfect because it just makes the concept of love more authentic and leaves an air of mystery for the audience for what's anticipated if a sequel is produced. My enjoyment of this anime surprised me in a good way, I was going into this series expecting two people to eventually fall in love, confess to each other and by the end have their first kiss and that would be the end of this anime; just like and typical romantic comedy. To my surprise, it was the almost exactly what I predicted but with a slight twist of what I thought initially, you will have to watch and see I don’t want to spoil it! I will add, if you're into witty humour and stereotypical iterations between characters in a romantic comedy, this anime is right up your alley. However, if you're the type who just wants an rom-com anime where the main characters profess their love interests to each other, then you should not watch this until a sequel comes out. Love in real life takes time and work, it doesn’t happen as soon as most romance anime depict it to be. It's refreshing to see that within a short anime, the important aspects of love is not crunched into 12 episodes. Overall I loved Bokura wa Minna Kawaisou and have absolutely no major complaints, if you want an authentic romance anime with some witty comedy, I’d suggest you watch Bokura wa Minna Kawaisou. It just needs a second season to wrap everything up.